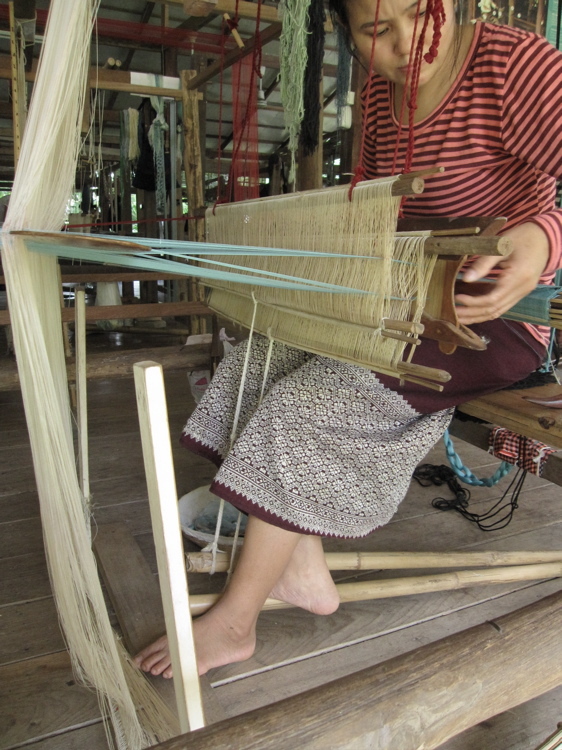 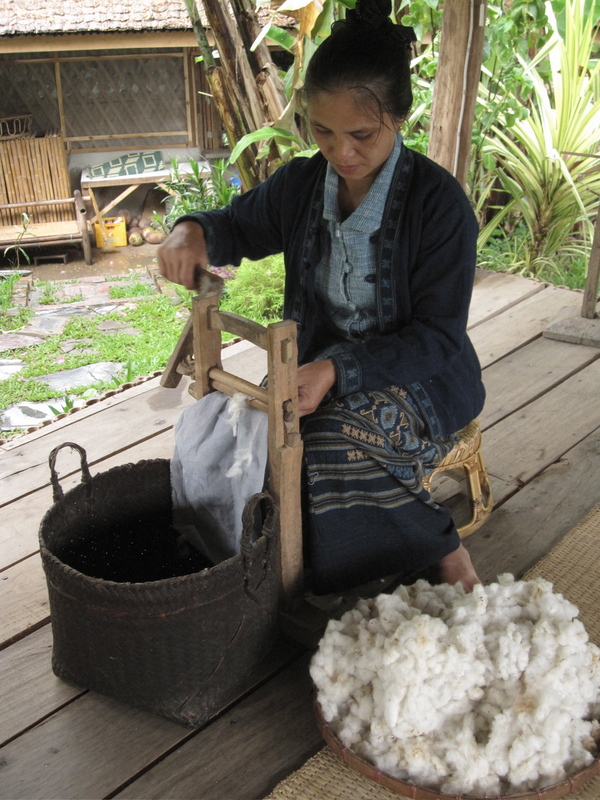 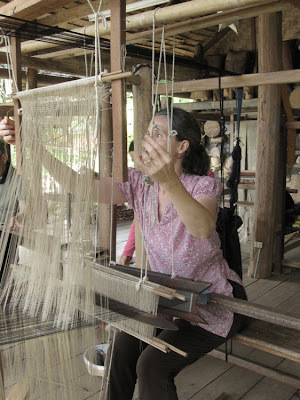 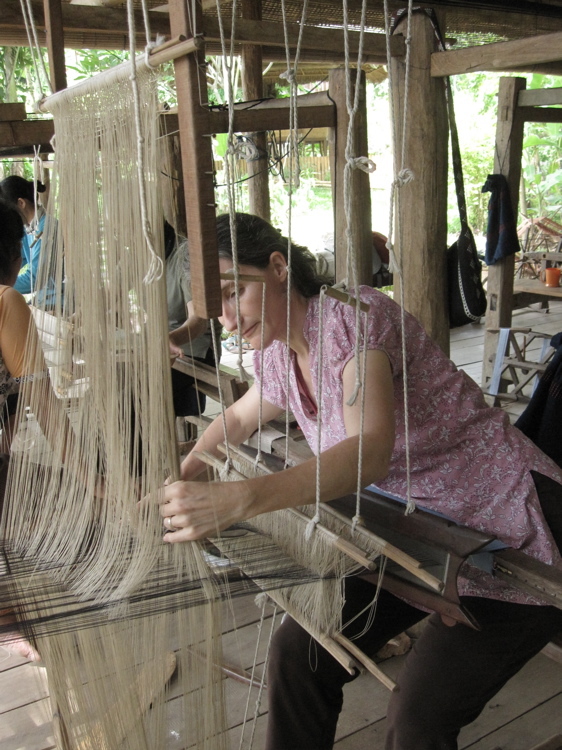 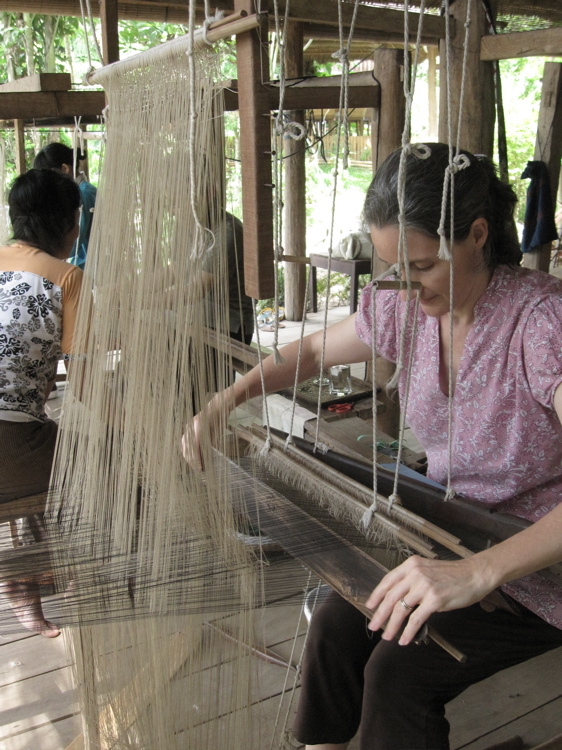 When I came to Laos, I was hoping to see some cotton fiber preparation and spinning. 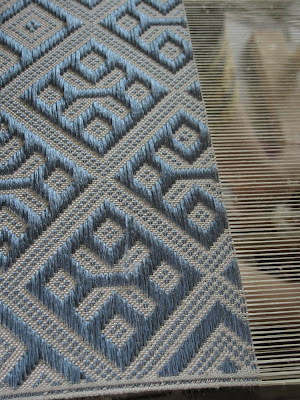 The Living Crafts Centre being what it is, it did not take long to coordinate my interests with the needs of the centre. There is a cotton display that required attention, and women from a major cotton producing area were due in town. 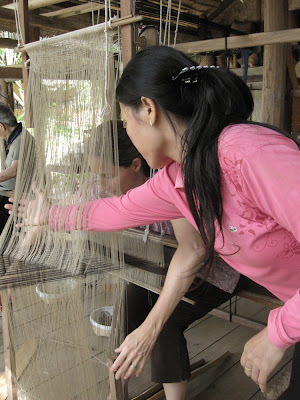 One of these women, Euay Navon*, came to demonstrate the various steps of the process, and I got to simultaneously document and learn from her. 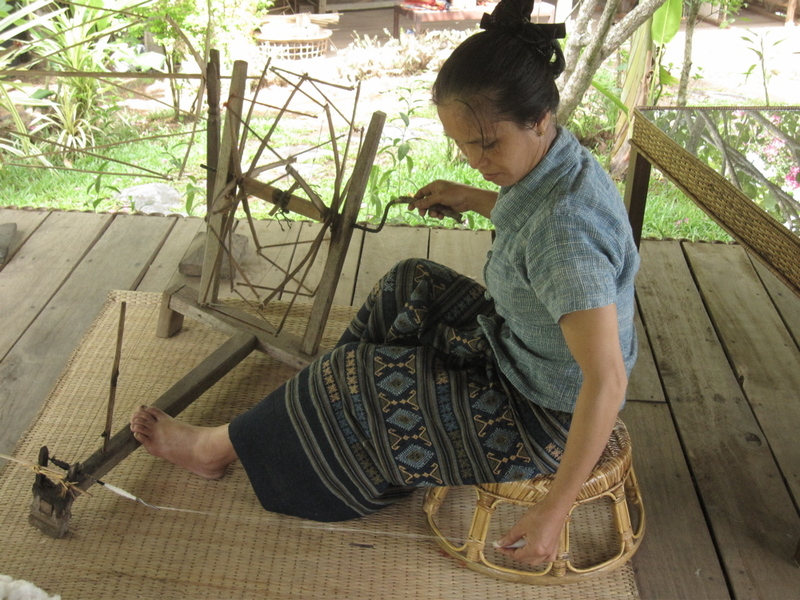 Notice that she is beautifully dressed in all handspun, handwoven cotton, in several different types of material. 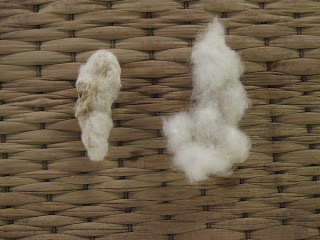 The cotton, she said, was not the best quality, because it hadn’t gotten enough sun to dry out after picking. She also showed how it can get damaged by rain, if the water gets inside the pod as the cotton grows (left damaged, right good). The bad parts have to be sorted out, then the seeds can be removed with a hand-cranked gin (eeuw in Lao). This was so much easier and faster than other seed-removing methods I’ve seen, such as the Ethiopian rolling of a stick against a stone to squeeze away the seeds. 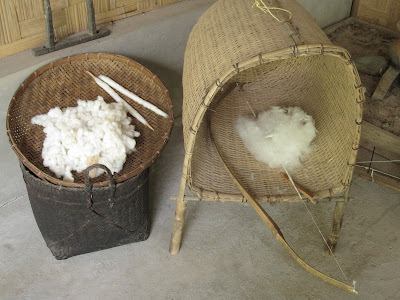 The ginned cotton is then fluffed up using a bow (kâ gong) inside a horizontal barrel-shaped basket. This is similar, conceptually, to the bowing done in India by men who go around and re-fluff the batting of quilts. Somehow, the flicking of the bowstring teases the cotton apart, eventually making it into a nice, fluffy cloud. 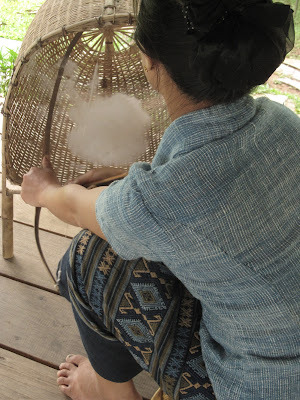 Some technique is definitely involved, and my clouds are not as fluffy as Euay Navon’s. 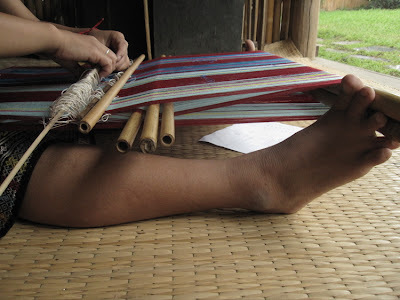 The cloud is separated into bits about the size of two handfuls, placed on a smooth surface, and rolled around a stick to form a cylindrical puni or fai lor. 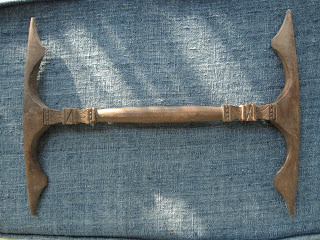 These are made nice and firm, tightly packed before the stick is removed. Now we’re ready to spin on a wheel (lâ), or technically a wheel-driven spindle, just like the Indian charka. 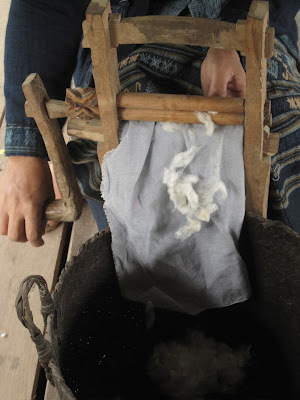 The wheel is turned with the right hand while the cotton is spun long draw against the quill with the left hand, as with a charka or a great wheel. 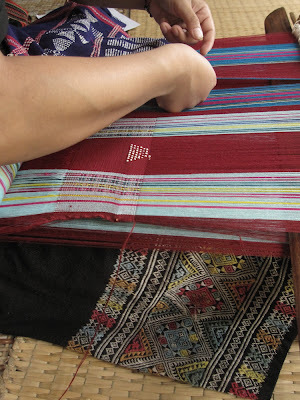 Euay Navon makes relatively short passes, not allowing the yarn to wind on too close to the quill before drafting back again. 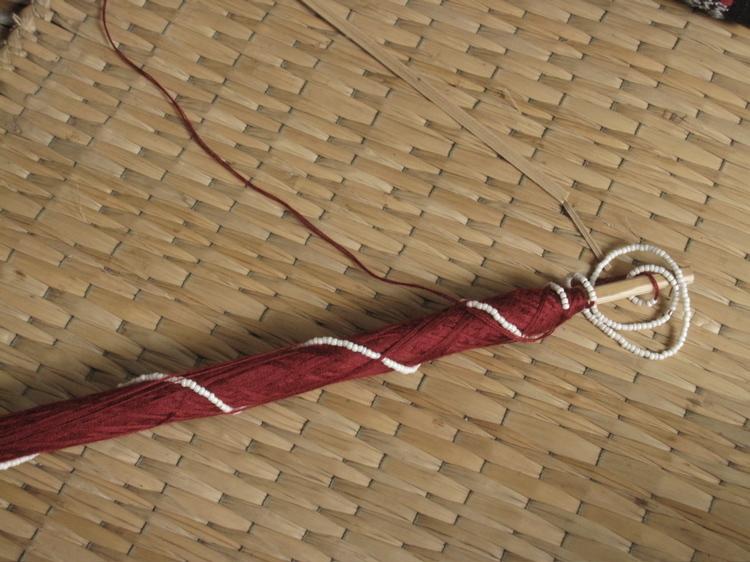 She is a patient teacher, and emphasized the importance of pulling quickly, straight back from the quill tip, with a slight vertical angle. 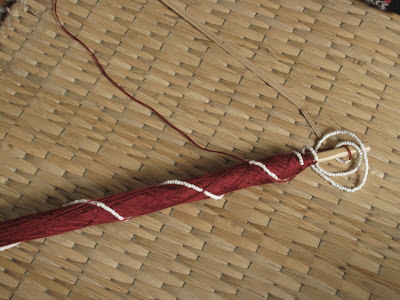 Trying this, I experienced that ‘leap of faith’ I’ve heard spinners talk about regarding long draw – at times, Euay Navon would pull my hand back for me, and it seemed so fast, and she’d make a cranking motion with her right hand, telling me to keep adding twist. 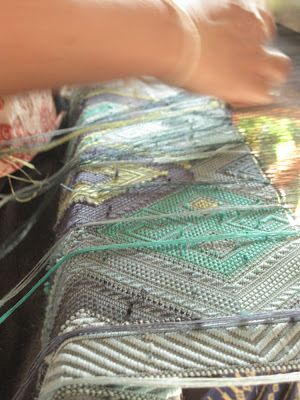 That balance of speed and control is a delicate thing, and I only got it for brief moments before turning clumsy again. The spun yarn is skeined on a niddy-noddy (piya), of which there is a beautiful example here at the Living Crafts Centre. 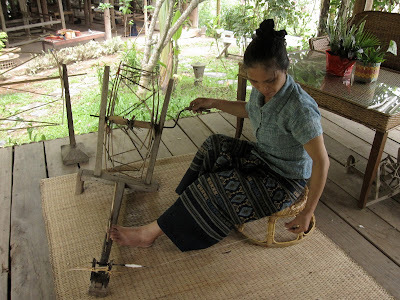 I didn’t find it in time to get Euay Navon to demonstrate, but it has both sets of arms parallel, so they must wind on straight. Will research further…. 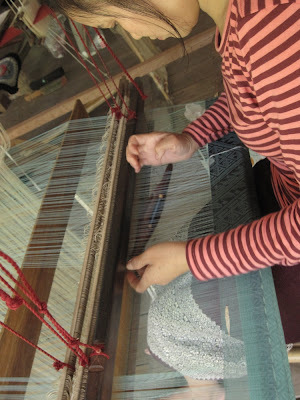 Much of the weaving is done with singles, such as Euay Navon’s beautiful indigo plainweave shirt. 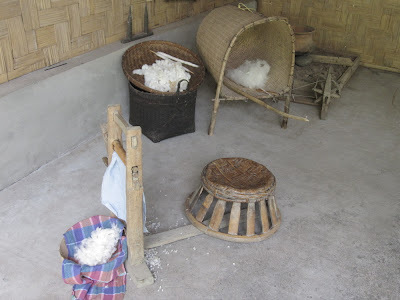 This was such a treat and a privilege, and now I practice my newly learned techniques to make the cotton display informative and authentic. 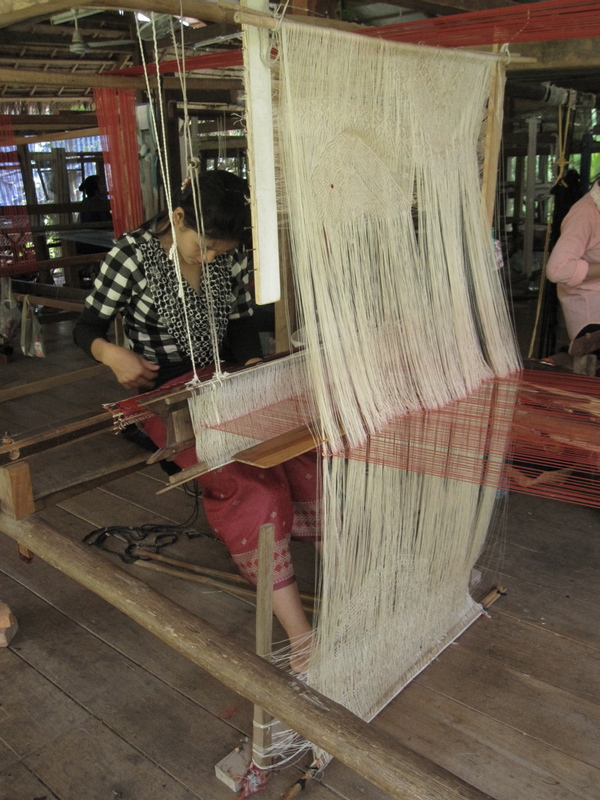 Several of the silk weavers are also accustomed to working with cotton in their home villages, and they took to the ginning and bowing as soon as it was put on display. This is a good way to find out who has the knowledge: put the tools in front of them, and they can’t resist showing their stuff. * Euay is a respectful Lao term of address, literally meaning 'older sister', which Euay Navon is to me, by just a very few years. 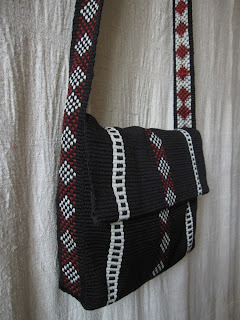 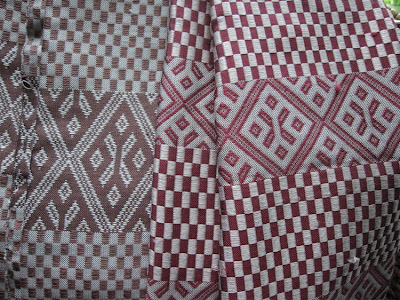 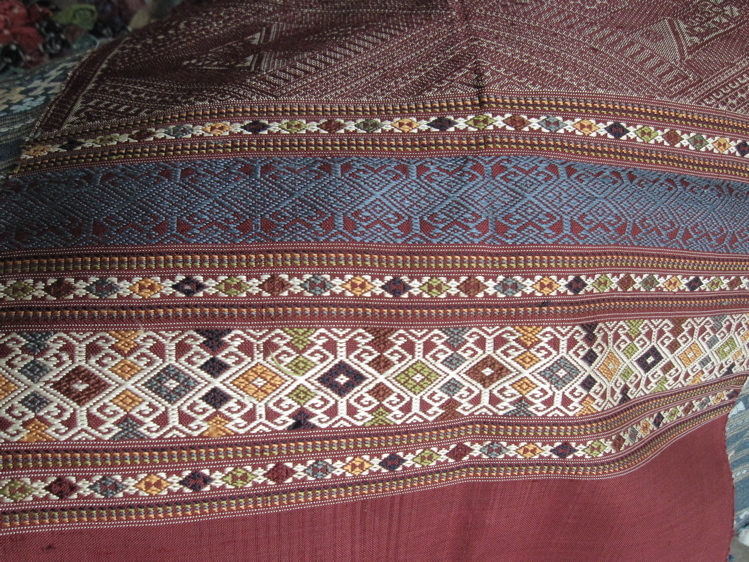 ....because I just can't get enough of this weaving style, and Geo was wearing a skirt she wove today. 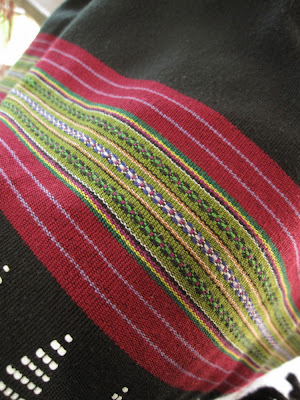 Is this stunning, or what? 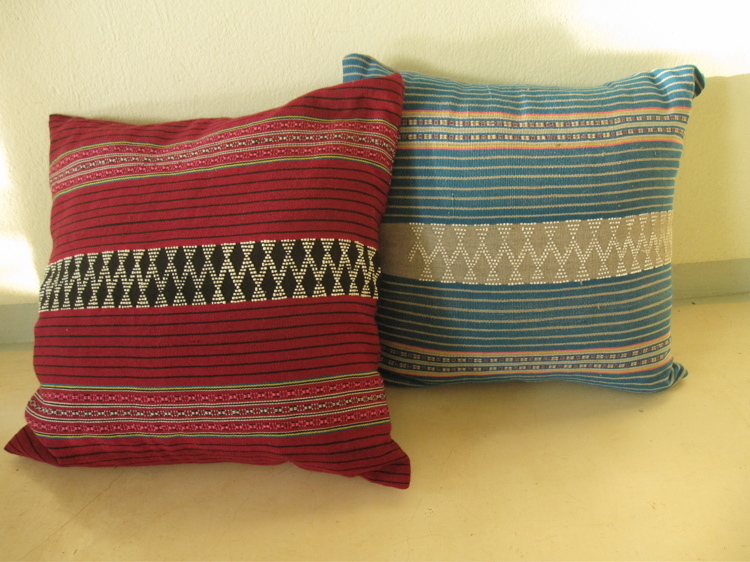 And some pillows, displayed in the villa. 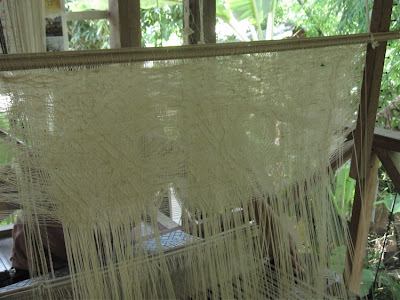 I am definitely developing a soft spot for the Katu weaving. 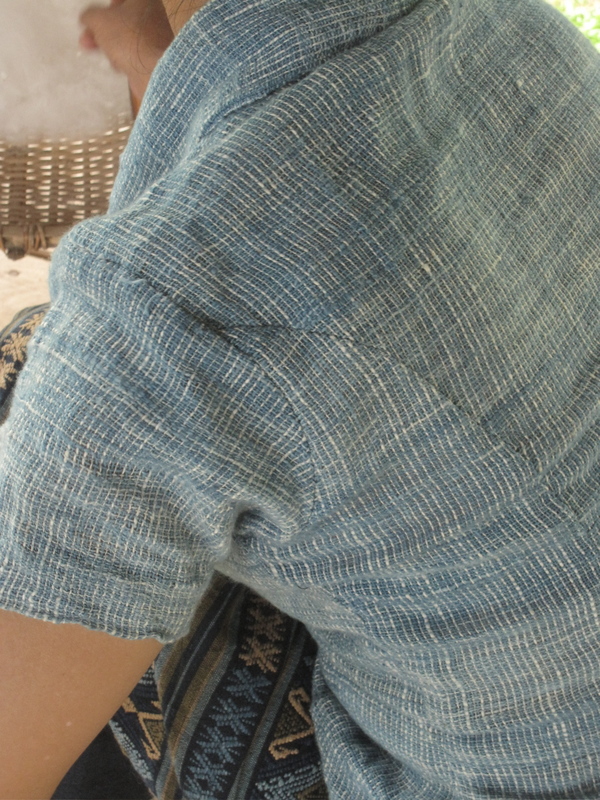 Probably because it's done on the backstrap - it appeals at a visceral level. 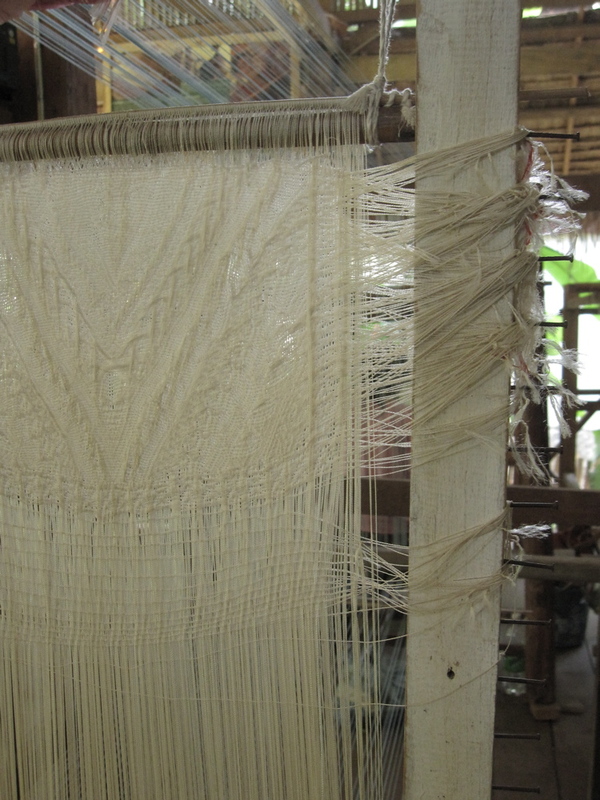 It's amazing to be surrounded by weavers, and I was especially happy to find that there is backstrap weaving going on here. Keo, shown here, and her sister Mone have come from the south of Laos to work at Ock Pop Tok. 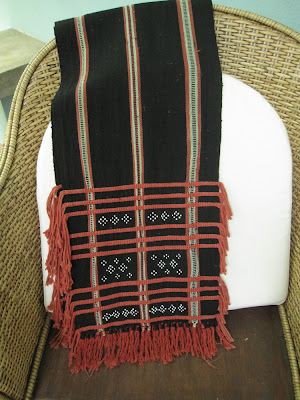 I had seen the Katu style of textile before, because the traditional men's garments have weft twining, and they come up in image searches of 'weft twining.' 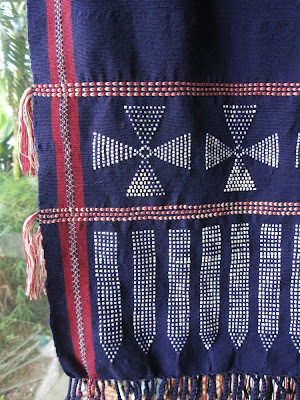 Three of these loincloths are hanging in my room - I coincidentally got the room decorated in the Katu style. 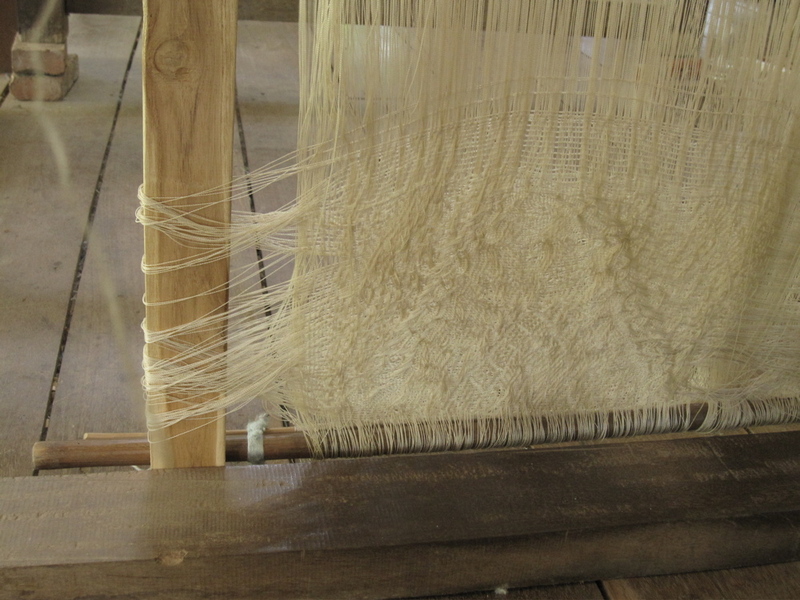 Needless to say, I've been observing Keo's weaving as much as I can. 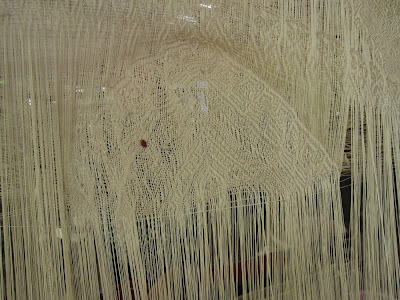 Her foot-tensioned loom is warped with four metres of cotton which will be woven in a tubular manner, rotating around the loom beams. 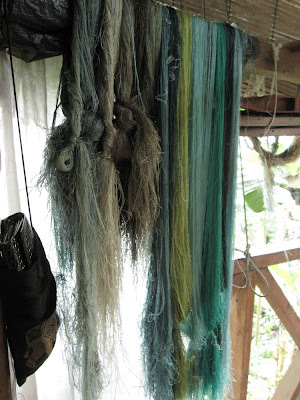 There are three shed sticks, and two string heddles. 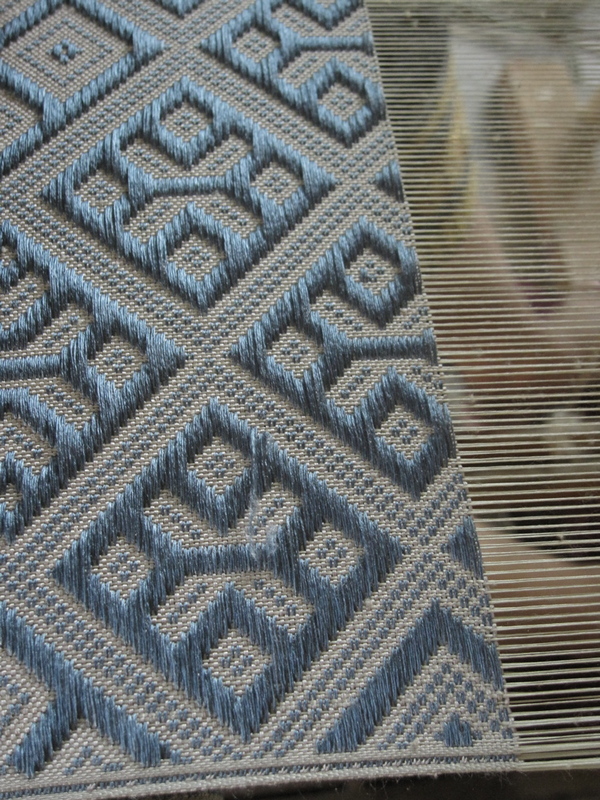 The extra sheds control the intricate warp float designs within the stripes (as seen in the chair details and the detail in the last post.) 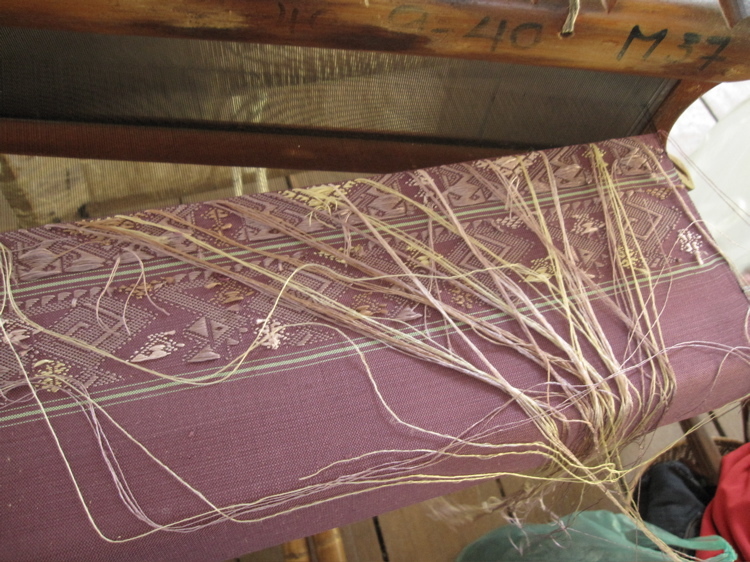 The string heddle is a simple, self-adjusting heddle wound around the warps, with no knots or other tricks. 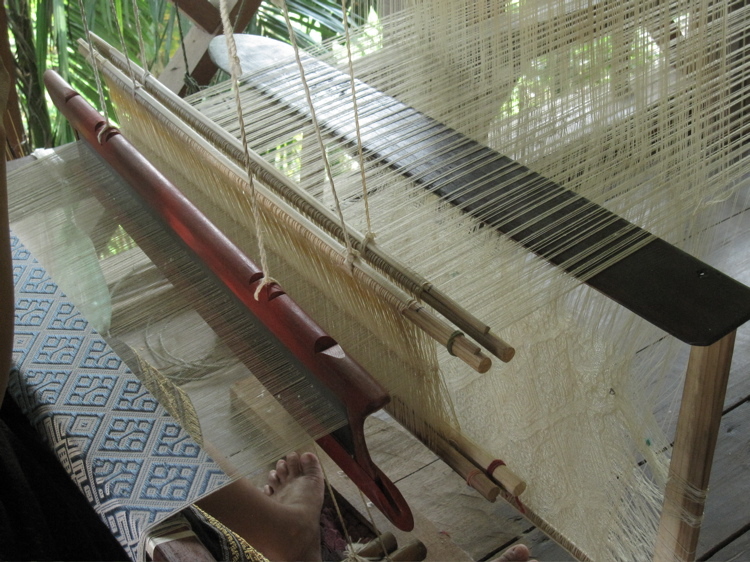 There is a safety line running through in case the rod slides out, because it's not even secured tightly at the ends. 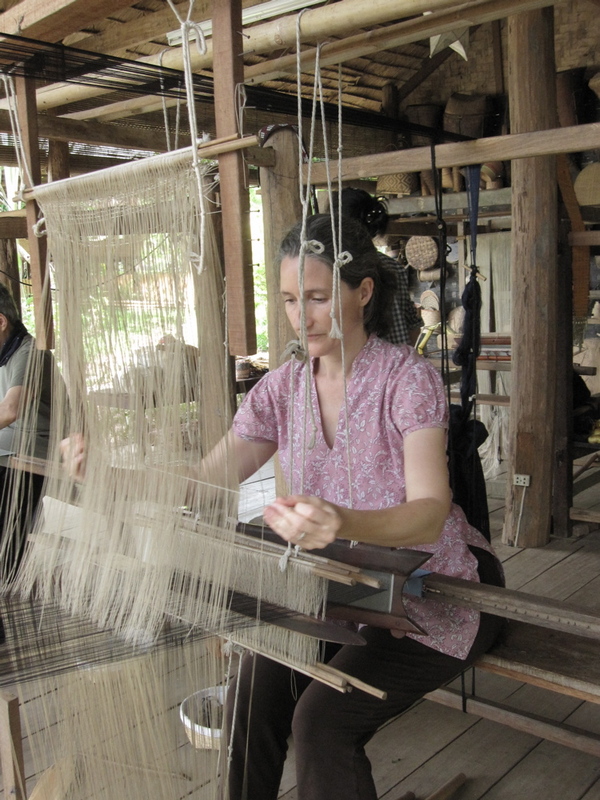 Notice there are no yarns holding her other shed sticks in place, and no second cross. 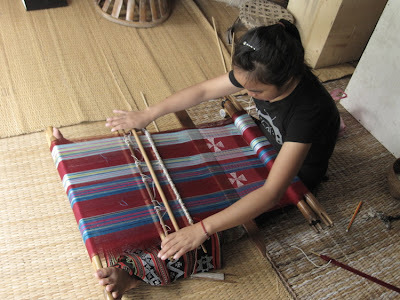 She does not get up from weaving without carefully rolling the warp up, from the feet toward her. 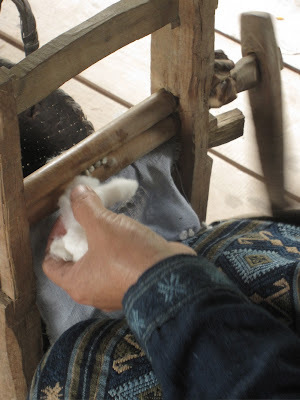 Her feet flex and extend as she changes sheds, and also while she works the beads into place. 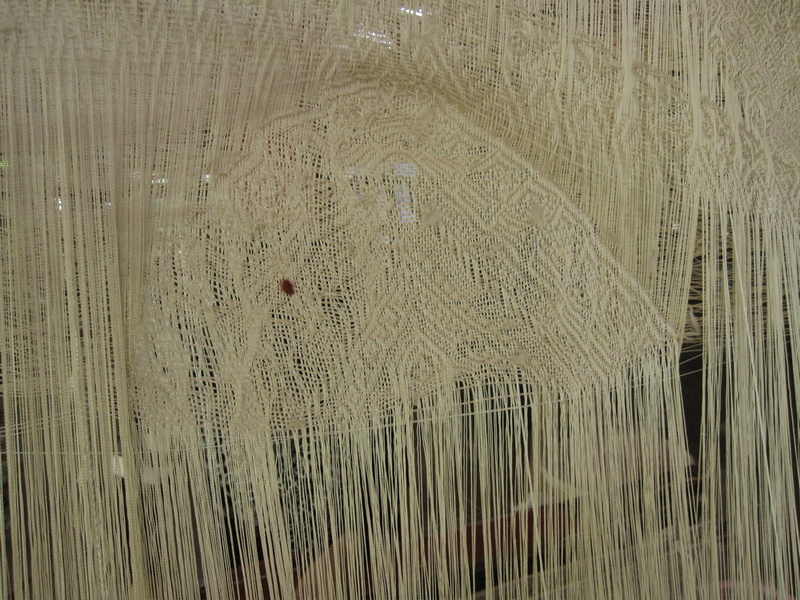 The beads are strung onto the weft thread, and counted out before she passes the shuttle. 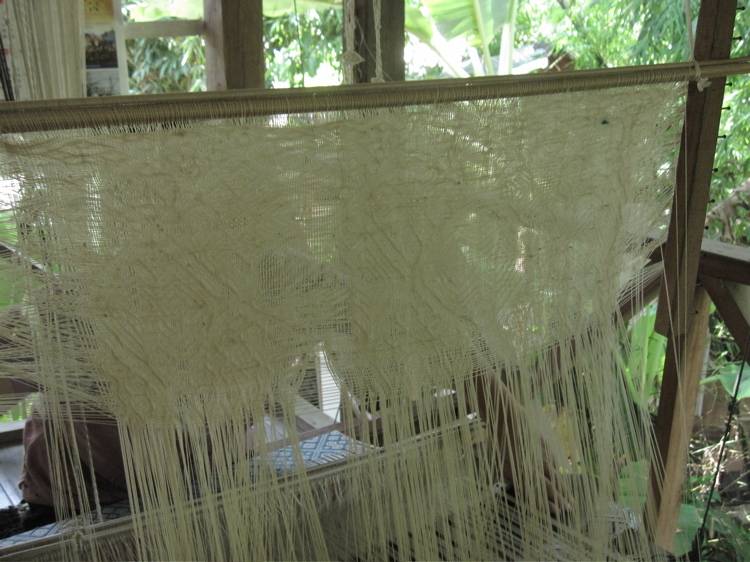 She makes use of a finished piece (with weft twining, see?) 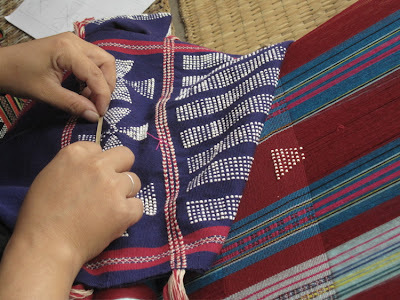 to measure the size and number of beads needed for her flower motif. 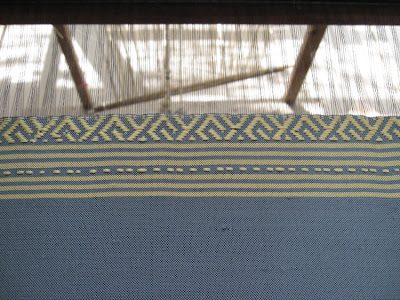 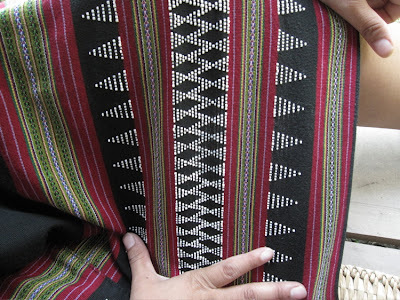 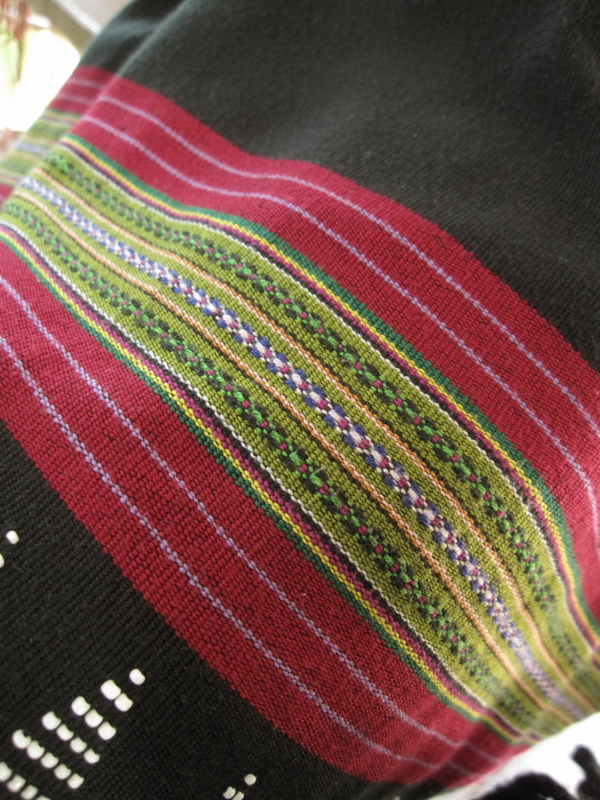 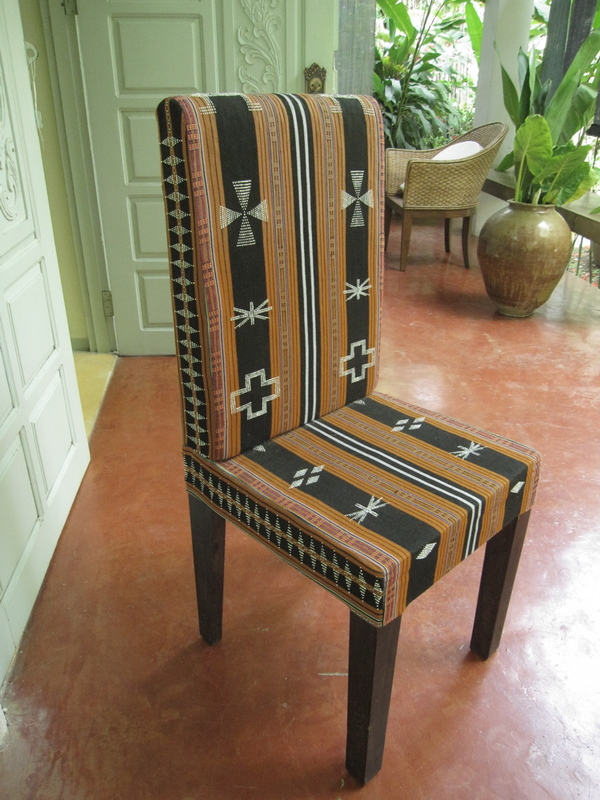 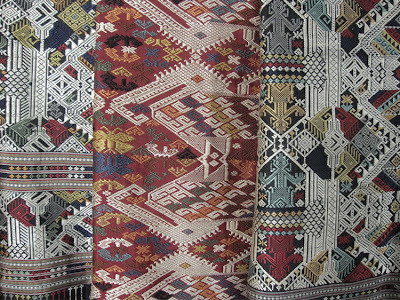 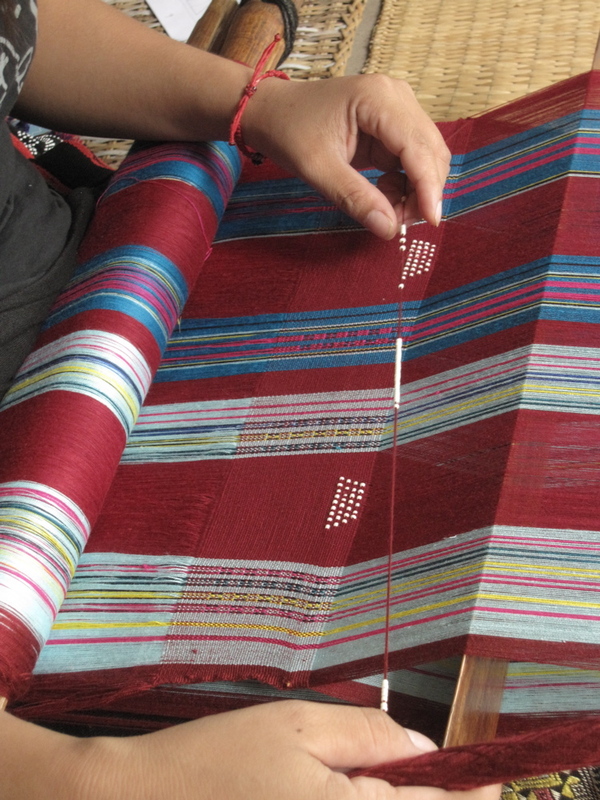 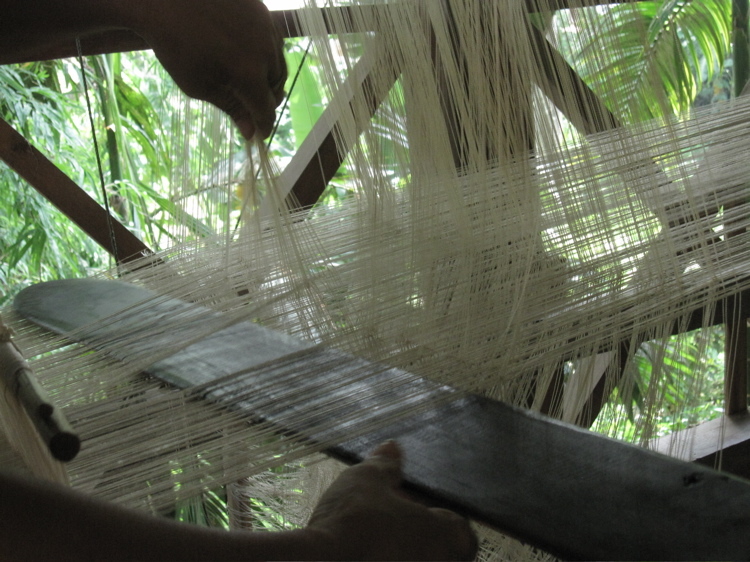 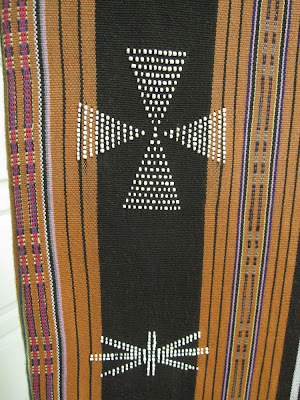 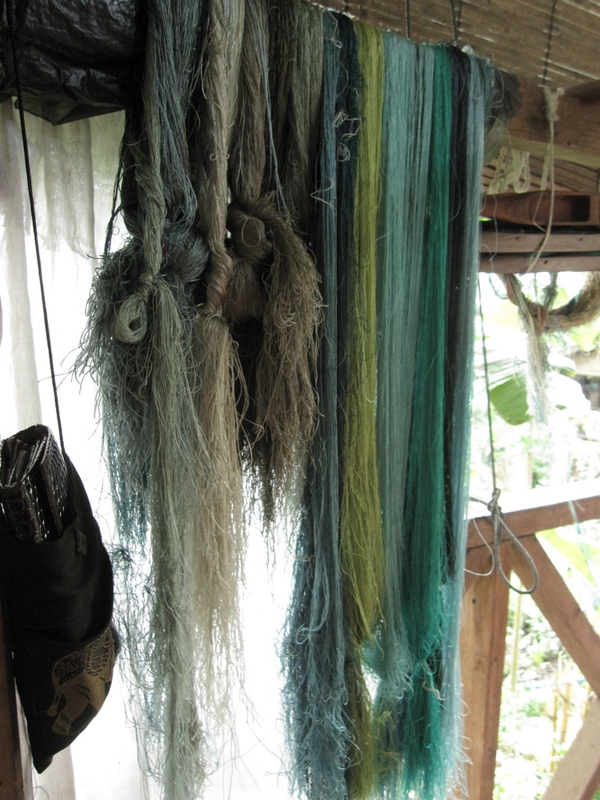 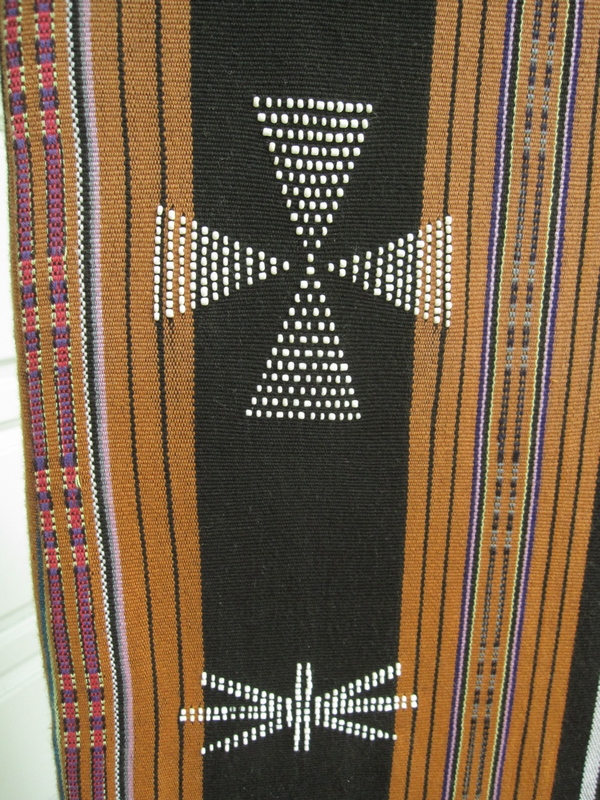 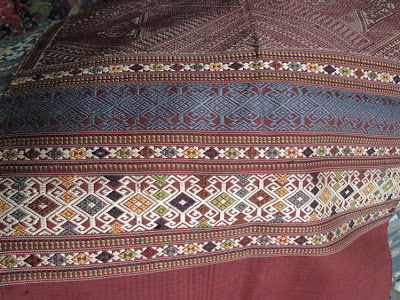 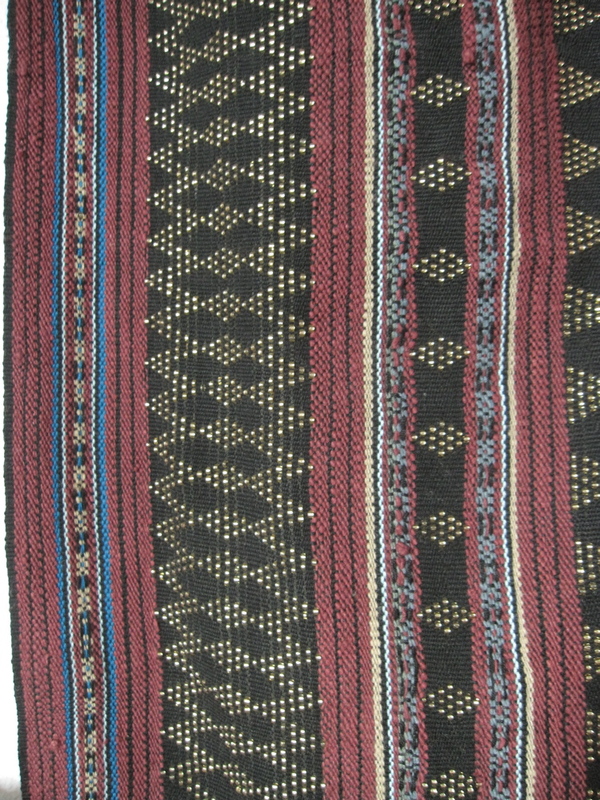 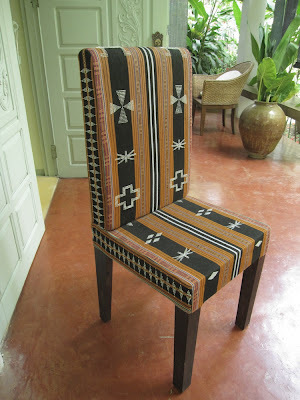 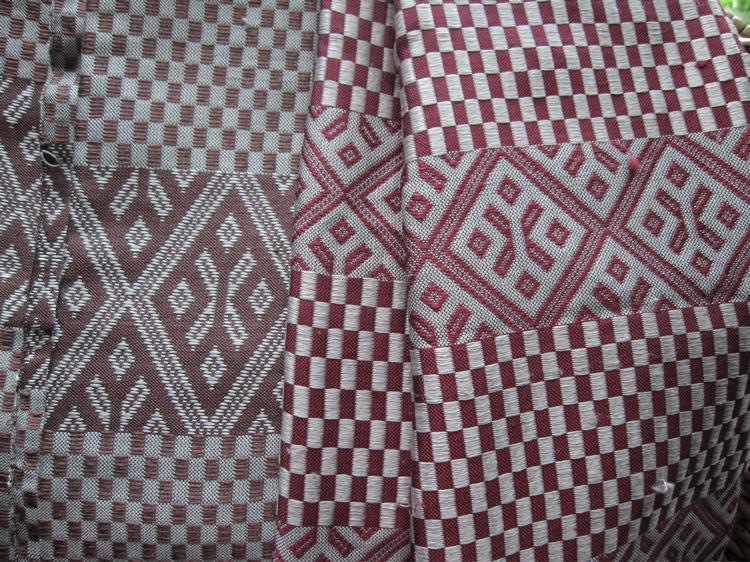 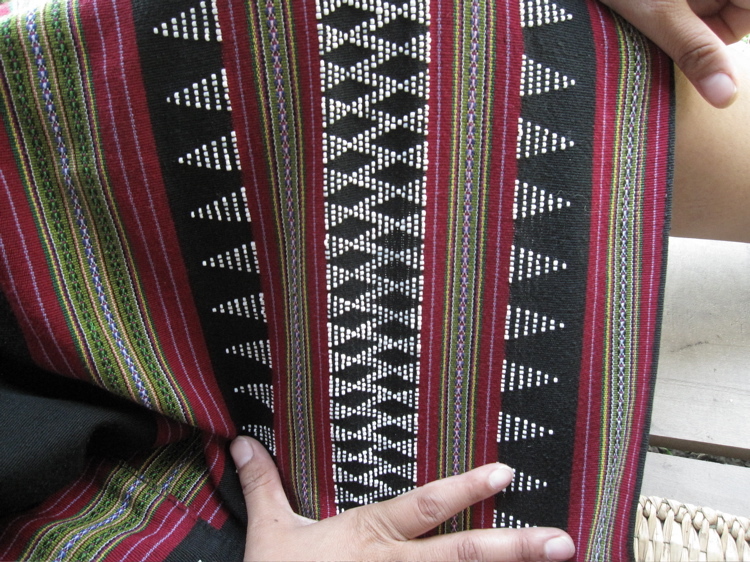 The traditional weavings vary in design, color, and density of beading. The beaded part takes a lot more time, since they have to be counted, and worked into place one by one. The piece Keo is working on now is an Ock Pop Tok design, which will actually be split into two along the middle of the warp when it's finished, and used on two different skirts. 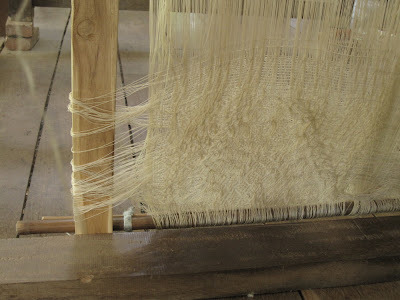 It's more efficient to weave the two parts as one. 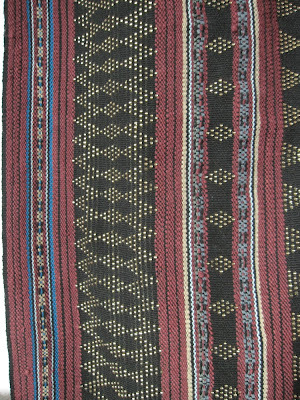 More pieces from the showroom at Ock Pop Tok, and one of the women working here has a very beautiful bag that is all patterned stripes and no beading, which I need to photograph. I have also uploaded a short video showing Keo weaving. 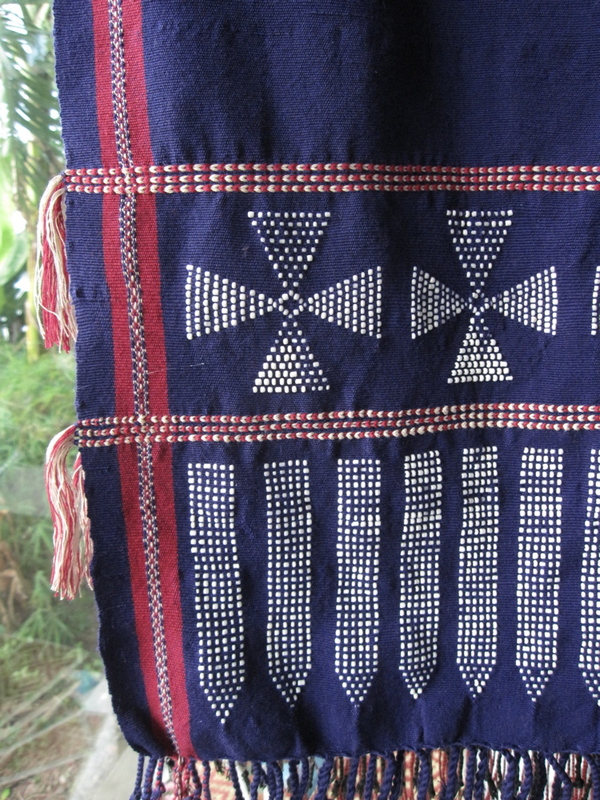 A further coincidence is that the ouerjan design on my Bedu bag, which I'm carrying here, reminded Mone of Katu designs - from a distance she thought there were beads in it! 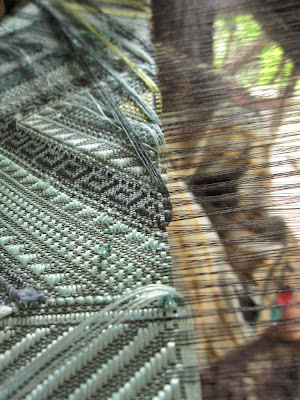 This hadn't even occurred to me, but the effect is very similar. Eventually I showed Keo photos of Bedouin weaving in Qatar. 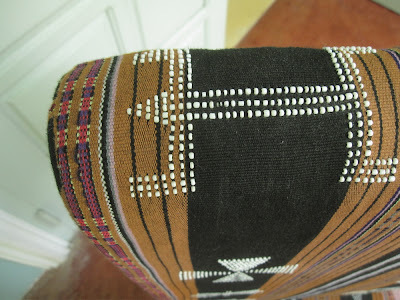 I had never dreamed, when I searched 'weft twining' months ago and came up with Katu images, that I'd be sitting with a Katu weaver and showing her imaged of Bedouin weft twining and saying, "See? 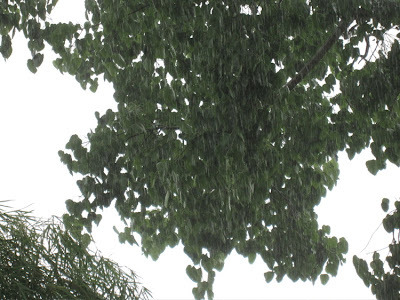 Same as Katu." I am living a textile fanatic's fantasy, and every day is full of awe and delight. 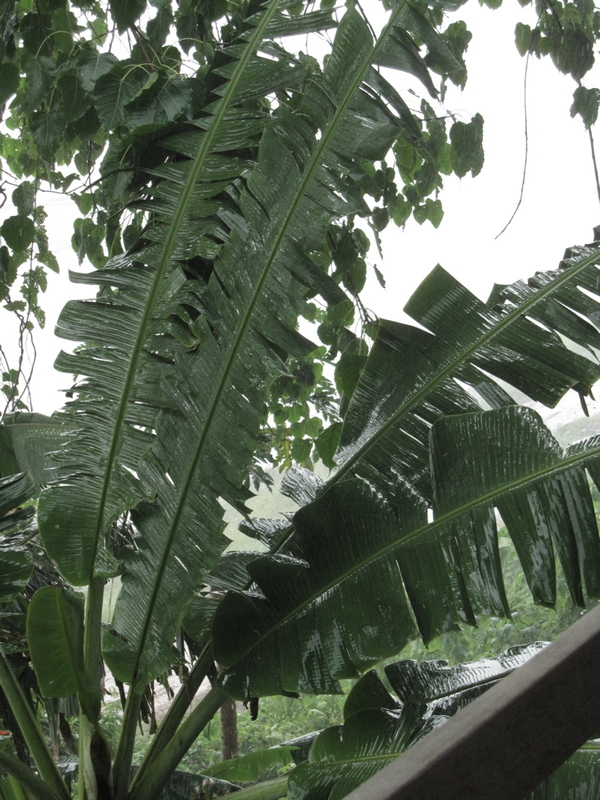 The rainy season began in earnest the same day - rain is audible in the background of part of the video.